Whether it's barreling down tunnels of changing orange and red leaves, enjoying crisp and cool air on an alpine ascent, or simply loving life as you commute to work without the blaring sun and oppressive heat blazing down on you, autumn makes for some of our favorite riding. All of these pleasures, however, are challenged by temperamental weather that can 180 from pleasant to nearly torrential downpours in a matter of minutes. 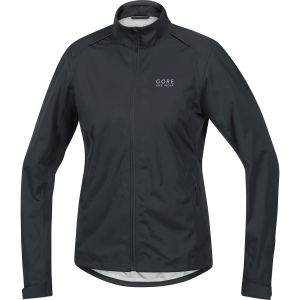 Not to worry, though, Gore Bike Wear's got our back with their Element Lady Gore-Tex Active jacket, so we can stay dry and warm through the fall months. With 2. 5 layer construction, Gore combines water repelling, wind slicing, moisture wicking, and style into one fashionable jacket. The Gore-Tex layer is perhaps the most important part of this jacket, and really what sets it apart from other options, with exceptional moisture transfer, allowing perspiration to escape, and external water to roll off with ease. With durable polyester backing it, it maintains strength, slight stretch, and warmth as you roll through icy gusts, or get snagged by branches on your descents. The fit of the Element Lady Gore-Tex Active Jacket offers more room than their slimmer options, so you can layer up if you're going for a late afternoon ride loaded with shady spots and brisk chills. It's equipped with two front zippered pockets to secure the gear you need easy access to in the saddle, adjustable cuffs to keep moisture and wind outside, and a cord adjustable hem to keep your mid-section toasty. Boosting your visibility to motorists, reflective accents highlight your collar bones, arms, and lower back, along with reflective logos so you can ride with confidence in low light situations.